Lee and Lucy Gilray say their big day was spoiled by boozed-up medical students who intimidated guests and vandalised the hotel. Prof Heys pledged to be transparent about the results of an investigation which was launched after boozed-up students ruined a north-east couple’s wedding reception last week. 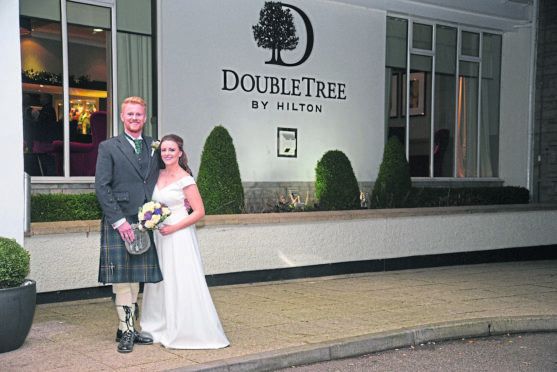 Ellon couple Lee and Lucy Gilray’s reception was held at the Hilton Treetops hotel a week past on Saturday, at the same time as the Aberdeen University Medical Society had a social function there. However the students’ party descended into chaos and they subsequently “rampaged” into their celebrations. The groom’s gran tried to flee from the melee, but fell down the stairs and sustained a severe injury. The university launched an inquiry into the shocking events, which led to 85-year-old Elizabeth Swan requiring an overnight stay in hospital and stitches for a three-inch gash in her head. Mr Gilray’s terrified gran, Elizabeth Swan, 85, was trying to escape the disturbance when she fell down a set of stairs, leaving her with a three-inch gash on her head which required staples and an overnight stay in hospital. Prof Heys said: “What is happening now is an investigation has been launched which is being undertaken buy a member of staff from a different school.